Sir Charles Lyell (Nov. 14, 1797 - Feb. 22, 1875) attended Oxford University at age 19. Lyell's father was an active naturalist. Lyell had access to an elaborate library including subjects such as Geology. When Lyell was at Oxford, his interests were mathematics, classics, law and geology. He attended a lecture by William Buckland that triggered his enthusiasm for geology. Lyell originally started his career as a lawyer, but later turned to geology. 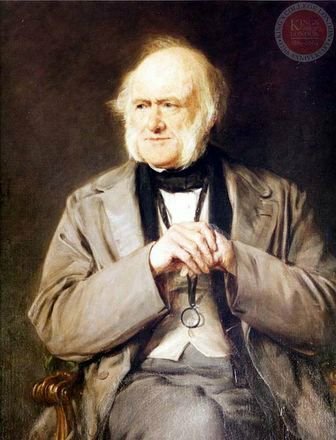 He became an author of The Geological Evidence of the Antiquity of Man in 1863 and Principles of Geology. Lyell argued in this book that, at the time, presently observable geological processes were adequate to explain geological history. He thought the action of the rain, sea, volcanoes and earthquakes explained the geological history of more ancient times. Lyell rebelled against the prevailing theories of geology of the time. He thought the theories were biased, based on the interpretation of Genesis. He thought it would be more practical to exclude sudden geological catastrophes to vouch for fossil remains of extinct species and believed it was necessary to create a vast time scale for Earth's history. This concept was called Uniformitarianism. The second edition of Principles of Geology introduced new ideas regarding metamorphic rocks. It described rock changes due to high temperature in sedimentary rocks adjacent to igneous rocks. His third volume dealt with paleontology and stratigraphy. Lyell stressed that the antiquity of human species was far beyond the accepted theories of that time. Charles Darwin became his dear friend and correspondent. Darwin is quoted saying, "The greatest merit of the Principles was that it altered the whole tone of one's mind, and therefore that, when seeing a thing never seen by Lyell, one yet saw it through his eyes." Image from King’s College London.